SMARTY Trend head device overview for Siat Altea. Car Seat Altea is a bright representative of its class. Compact stylish car that is ideal for the metropolis. The car proved to be excellent, but functionality leaves not much as desired. Of course, you can buy a car with the maximum configuration, but even this equipment has a number of disadvantages. There is an exit! The company SMARTY Trend will help you in choosing the device for your car. Let's look at the SMARTY Trend tape head unit with you. Head unit company SMARTY Trend are regular. This means that this device is specially designed for this car with a certain configuration. Thus, when installing this device and connecting it, there is no difficulty, or additional work, on installing it. Connecting the connector to the connector ensures easy installation of the head unit. All SMARTY Trend head units are equipped with a navigation module. This means that the determination of your location, the adjustment of the route takes place via satellite communications. It is very convenient, because now there is no difference you are in a huge city or in a small village. You can always quickly select the destination path, set a route and go. All head units of the company SMARTY Trend are based on the Android operating system. This allows you to use a huge amount of functionality, install various applications, watch media files of any format, change and save individual settings to your liking, connect any flash carts with capacity up to 1 TB. The Internet is an integral part of our life. Head units SMARTY Trend will give you the opportunity to access the Internet in your car. You can easily use your mobile phone as a point to create access to the Internet. If you want to create a permanent access point in your car, install a 3G / 4G modem, it is much more convenient since you can connect absolutely any of your device. Let's summarize with you the results that I want to mention this visual change in the center console of the car. The quality of the head unit is very high, excellent viewing angles, the speed of the work is a significant advantage when the device is working. This device combines excellent functionality, original design and optimal price. 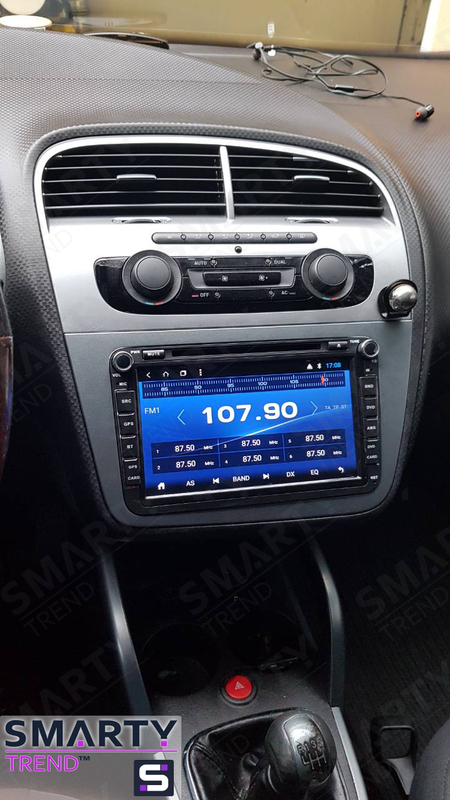 The company SMARTY Trend offers you the best head unit, just for your car! Tag: Smarty Trend, Android head unit, Android, Head Unit, Video review, Multimedia, Entertainment, Car audio, Seat Altea.